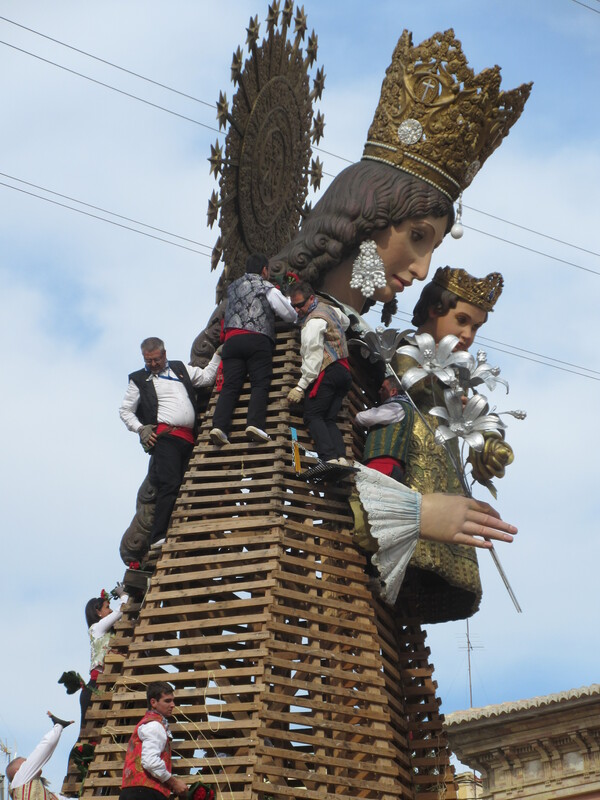 I’ve already posted about two major parts of Valencia’s annual spring festival: the exuberant noise-making and the fabulous artistic creations of the fallas (giant sculptures) themselves. B ut there are other elements to impress visitors as well. On March 17th and 18th, it seems like all 800,000 Valencians dress up in traditional native costumes and parade through the city streets. The women and girls carry bouquets of red or white flowers, whi le some of the men wheel or carry huge floral arrangements. And by huge, I’m talking 6 or 7 feet wide and of a similar height. Each neighborhood group winds its way to the Plaza of the Virgin, where the bouquets are used to form the robes of an enormous statue of the Virgin Mary and baby Jesus. The first group enters the plaza at about 3 PM each day. The last doesn’t arrive until well after midnight. Just getting the flowers placed is a ballet. Each bouquet is handed off to a helper who piles them by the side of the giant wooden structure. From there another helper tosses the bouquets to someone else, standing on a narrow ledge b uilt into the statue 8 to 10 feet off the ground. That person tosses the flowers up to someone clinging to the wooden struts near the top of the statue. And he hands them to someone even higher up who wedges them into the structure, carefully following an elaborate red and white pattern that’s different each year. Nearly all of these helpers are male, though a few young women, clad in traditional men’s short pants and embroidered vests could be spotted. One young lady was having trouble tossing the bouquets high enough to reach her colleague, and I was heartened to find that the crowd was encouraging rather than disparaging. She eventually got the hang of it. Meanwhile, the huge arrangements are massed together to the side and in front of the adjacent Bishops’ Palace. By the time all the flowers are in place on the 18th, the blocks surrounding the plaza are perfumed with their scent. Across town, crowds gather every night on the sides of the old riverbed that now forms a miles-long public park curving around the ancient part of the city. For four nights in a row, the city sets off a spectacular fireworks display. On day 1, it starts at a relatively reasonable hour of midnight. By day 4, the show doesn’t begin until 2AM. I’m not sure anyone sleeps at all during Las Fallas. 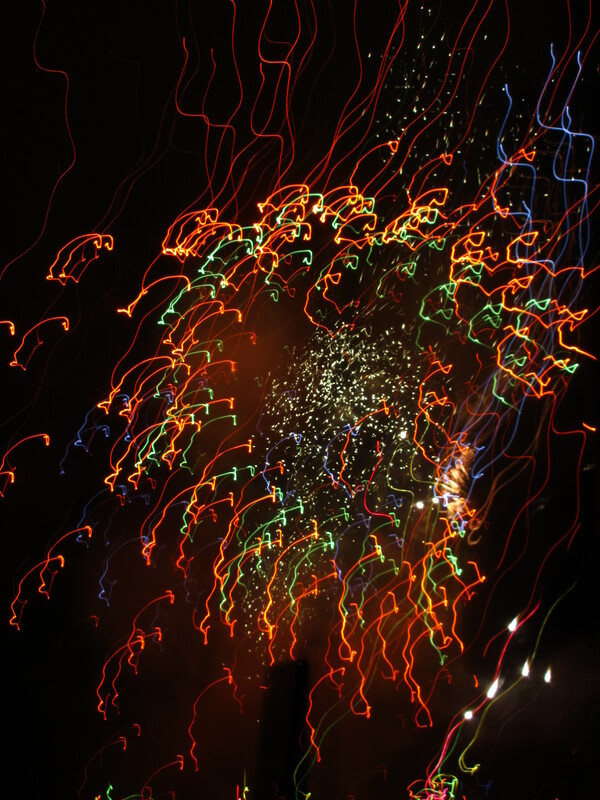 The fireworks themselves aren’t much different than those in New York or Washington or Boston on the Fourth of July. There’s the usual assortment of sparkly golden spheres, silver showers and colorful bursts. What is different here is the number of fireworks the y set off at the same time. There are times when you can see only a blur of light, there are so many going off at once. The Spanish also seem to like to set off rows of rockets that streak color from the ground up—sometimes crisscrossing in mid air—while simultaneously huge blossoms appear overhead. It’s a wonderful sort of chaos. And finally there’s the light displays in the Ruzafa neighborhood. Traditionally, each neighborhood strings decorative lights across their narrow streets, marking their territory with a distinctive design. Most of them are qute pretty and quite tasteful. But the Ca lle Cuba and Calle Sueco are really something. Remember that Danny DeVito movie about the guy whose Christmas lights could be seen from space? He had nothing on the Ruzafa guys. From a 100 feet away, one display looked like some sort of neon cathedral, soaring into the sky. It wasn’t until I was practically underneath it, that I realized it wasn’t just a two-dimensional lighted outline. It was a block-long canopy of coordinated lights. That was amazing enough, but when they started blasting the music and the lights began a syncopated dance, the crowd roared. Me, too.